Water Quality: As it pertains to fish and aquatic life condition, Sylvester Creek is rated in good condition by the Wisconsin Department of Natural Resources (WDNR). This oblong shaped subwatershed just northwest of Brodhead stretches due west almost to Monroe. Sylvester Creek, 14 miles long, flows southeastwardly through agricultural landscapes before dipping south to join the Sugar River just north of Hwys 11 and 81. Sylvester Creek is listed as an Exceptional Water Resource (EWR) by WDNR. The four miles segment upstream from Balls Mill Road is managed as a Class III trout stream. All though Sylvester Creek is listed as a Exceptional Water Resource, it is not immune from runoff carrying nutrients and sediments from the surrounding, rolling agricultural landscapes. At issue in all the subwatersheds is phosphorous loading of our tributary streams leading to the Sugar River. 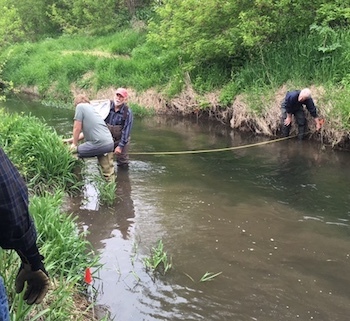 Water Action Volunteers (WAV) have been collecting water samples throughout the watershed for the past several years to analyze for total phosphorus. Two sites on Sylvester Creek, one at CTY OK and the other at Ten Eyck Road have been so mointored. Samples were withdrawn from each location from May through October. The results gleaned from the WAV website are summarized and presented in tabular form below. Clearly, total phosphorus median values have significantly increased from 2013 to 2016 at both sites and exceed the state's compliance criteria of 0.075 mg/L. Why is this important? Phosphorus, being an essential nutrient for plant growth stimulates aquatic plant and algal growth in our lakes and slower moving streams which diminishes their recreational use for fishing, swimming and boating. Property values decline. Additionally, decaying plants and algae consume the water's oxygen supply creating dead zones where little lives including fish. For a more in depth treatment of this subject click here. A good way to experience the rolling hills and valleys of this subwatershed is to take a road trip by heading west on CTH F out of Brodhead. Along the way you will pass two very popular businesses. 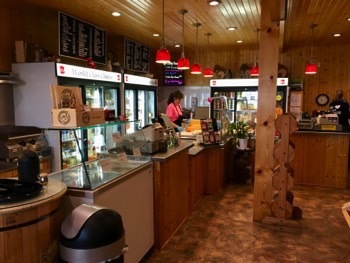 First to encounter is Decatur Dairy, Inc. located at W1668 CTH F. Award winning cheese, manufactured on site, as well as other locally made cheese, and sausages are available at the dairy's store (hours: 8 a.m. - 5 p.m., Monday through Saturday). Oh, and before leaving partake a cone of University of Wisconsin Babcock Hall ice cream. About one and quarter miles further along (route: CTH F⇒CTH OK⇒CTH SS⇒Greenbush Rd) stop at Ahrens Acres at 2176 Greenbush Road for your gardening and landscaping needs. The retail greenhouse sells annuals, perennials, herbs, garden vegetable seedlings and varous landscaping plants. 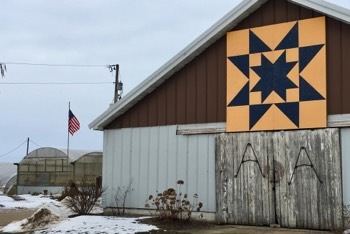 Admire the barn quilt art, FFA Rising Star which is one of the approximately 140 barn quilts located throughout Green County. For more information about barn quilts visit greencountybarnquilts.com. Continuing on Greenbush Road will eventually take you to the eastern outskirts of Monroe. It is indeed, a lovely ride over hill and dale. Is fishing your passion? Did you know that Sylvester Creek is a Class III trout stream upstream from Balls Mill Road? A Class III stream does not provide the habitat to support the natural reproduction of trout and requires annual stocking of brown and rainbow trout to provide a fishery. Before country schools were consolidated and closed in Wisconsin between 1950 - 1960 children living in rural areas throughout the​ Midwest were educated in one room school houses. 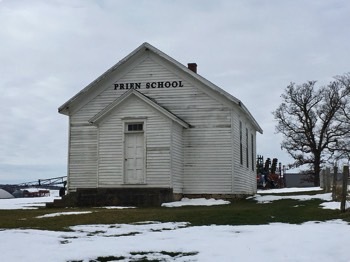 Such a wood framed school, Prien School is still standing today in Sylvester Township on Prien Road where it intersects with CTH SS near Hwy 59. 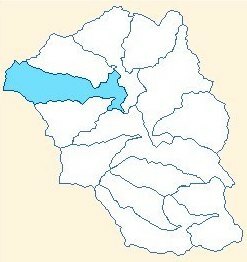 These schools usually educated children through the eighth grade. For a printable PDF map of Sylvester Creek Subwatershed click here.